Daily Illuminator: Warehouse 23 Has Turtles! March 15, 2019: Warehouse 23 Has Turtles! No, we aren't opening an exotic pet shop. (Although that would be fun!) 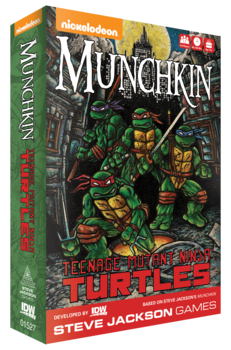 We've got copies of Munchkin Teenage Mutant Ninja Turtles in stock, and we didn't have to swim through toxic slime to get them! Play as your favorite turtle (Donatello, obviously), or choose Casey Jones or April O'Neill. Pick your Kata, grab some weapons, and clear all the bad guys out of the sewer. First hero to Level 10 wins. Radical, dude!